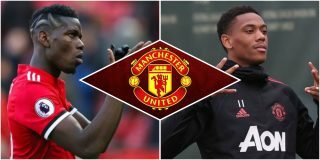 After months of ongoing speculation, Anthony Martial and Paul Pogba will not be sold by Manchester United. The two Frenchmen reportedly became fed up with working under Jose Mourinho last season and have since been linked with moves away from Old Trafford. Back in June, Martial’s agent, Philippe Lamboley, made it clear his client wanted to leave United. Lamboley told RMC Sport, as per The Guardian: “After thinking about all the factors and possibilities, Anthony wants to leave Manchester United. There are lots of factors, and right now it’s too early to talk about them. Manchester United want Anthony to extend his deal and do not want him to leave but we have not reached an agreement for several months. “I think that when Manchester United, the most powerful club in the world, do not find an agreement after eight months of negotiations then they do not really want to keep such an important player in their squad,” said Lamboley. “That’s why this decision has come – it’s a well-thought-out decision. The 22-year-old, who joined United from AS Monaco for £36 million in September 2015, has found life under Mourinho increasingly frustrating, with limited opportunities from the bench. Sources close to Stretty News understand Martial won’t be going anywhere between now and the end of August, with the transfer window still open for Spanish, Italian and German clubs. The same sources claim that Pogba’s situation is similar, though nothing solid has been reported about the World Cup-winning wanting to leave the club just yet. This should come as a relief to United fans, amid reports the former Juventus midfielder was attracting solid interest from La Liga champions Barcelona, as per The Independent. Pogba has unfinished business at United and shouldn’t leave until he’s reached his objectives. After all, he is also our most prized assist and Woodward will do his utmost to keep him at Old Trafford before of his commercial value, rather than any football reasons.